When the original Empire 208 was first released, it featured wow and flutter specs that, at the time, were unmeasurable. They have remained much so to this day and the 208 is known as one of the most speed-stable turntables ever built. To us, it seemed like the perfect place to start. So after years of tweaking, we offer you our own unique improvements to the original design. The result is, we think, an already solid product now refined to perfection: The Atma-Sphere Model 208. The first step in the process was to give the table a modern tone arm. We then tried several methods of damping the platter, including adding a new platter pad, which required some machining of the original platter. Finally, we completely replaced the original plinth. It had to be done; the stock plinth was made of cast aluminum and, despite outside appearances, is less than 1/4" thick over much of its area. To put it bluntly, it rang like a bell. Damping compounds helped only to a point, and we thought we could do better. So we made a new plinth from scratch, machined out of a solid piece of 6061 3/4" aluminum, and built it to accept all of the original turntable parts, including the power switch, motor, and platter bearing. The new plinth features an anodized finish far superior to the original shellac, but retains true to the style and class of the original. The final turntable, still looking the part of the original Empire 208, is a vastly improved machine. Not only is it extremely rigid, it now has superior coupling between the tone arm base and the main bearing. Both elements which are crucial for proper bass and transparency. Thus, the Atma 208 lacks the loudness cues and coloration of the original. And although we were just having a bit of fun, and seeing what we could do, the result easily rivals any turntable purporting to be state-of-the-art. 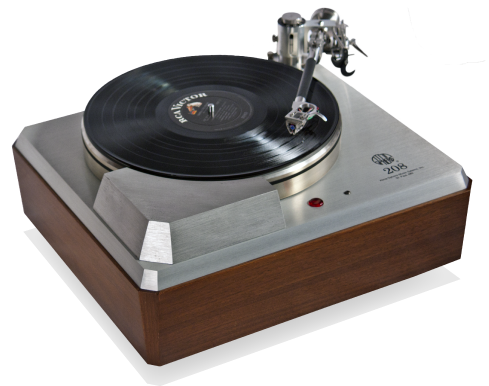 There are currently no reviews available for the the Atma-208 turntable. There are currently no manuals available for the Atma-208 turntable. More information is available upon request. To build an Atma 208, an original Empire Model 208 or similar is required; later models with suspensions (models 498, 598 and 698) cannot be used. The new plinth must be machined for the new tone arm to be used with it (we're currently using a Tri-Planar tonearm, as seen in the photographs). The original platter must also be machined to accept a modern platter pad, and is treated for resonance. The resulting platter retains a nice spindle ideal for use with a record clamp. New motor mounts and improved belt are installed.